Happy Holidays, I hope you have some time to enjoy! I thought everything was beautiful. The decor was spot on. Matthew was good, loved the choir, please tell them how much we appreciate and enjoyed them...You have been great! I could not have done it without you! I want to thank you from the bottom of my heart for caring to do a good job. Also, thank you for moving the Urns. We were able to enjoy them a little longer. Hello Araxie from cold Boston! I've been meaning to send this email a few days back but work has been crazy. I just wanted to say Thank you for making our wedding reception so incredibly memorable. Ricardo and I (and even my family) get calls and messages every day from the guests and from the people that saw the pictures on Facebook. Everyone keep (sic) saying how awesome and beautiful everything looked. Once again Thank You for all you did with this "last minute planning' (literally 2.5 months :)) in order to create such an amazing memory! Norb and I would like to thank you for our wedding decorations. My bouquet was beautiful and the ceremony and reception were just what we wanted. "Just a note to thank you all again for working so hard to make our wedding weekend smooth & memorable. I know there was a lot of work done above & beyond to give us the weekend we wanted. The beautiful photos speak for themselves in regards to Wildflowers. Olivia was absolutely incredible to work with. She calmed my nerves through the entire process. Natalie & Alexander, I know you helped tremendously to make this the event I had envisioned. Although the weekend wasn't what we had planned it was better than I could have ever imagined!!! All of your kindness is appreciated more than you know. Hope to see you on future visits!" "Georgette, it's UNBELIEVABLE! Took her breath away. She said it is the most beautiful arrangement she's ever seen. I agree. We're both crying like babies. A million thank yous! You made our day complete. May God richly bless you and your family." We are SO pleased with how everything turned out. You and your team did a fantastic job. 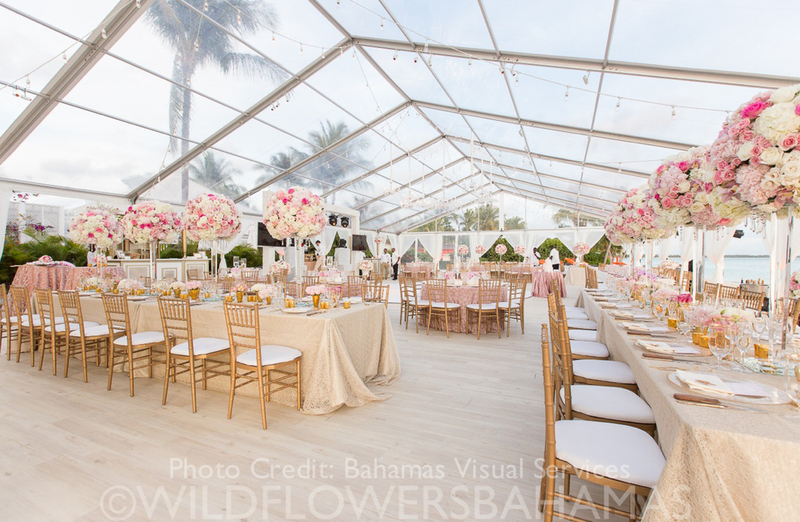 If we ever host any events in the future in the Bahamas you will be our first call for all of our floral/event decor needs." Thank you so much for transforming our venue spaces from beautiful to SPECTACULAR! Everything was was absolutely perfect and your artistry and vision were spot on. You have been an absolute pleasure to work with and I will miss you!!! Let's keep in touch, please!" Ash and I just wanted to thank you so much for all the hard work you and your team put into making our special day perfect! Everything was stunningly beautiful from the flowers, to the centerpieces. We genuinely cannot thank you enough. You are an amazing team of individuals!" Thank you so much for everything this past week/weekend. You have been a pleasure to work with and I will be sad to not have your emails weekly! We really appreciate all that you have done for us. Everything was honestly perfect :)!!" I hope all is well. Now that I'm off on my honeymoon I wanted to send a quick note to thank you for bringing my decor vision to life at my wedding and reception. Everything was perfect!!!! Thanks so much for all of your work. I truly appreciate it. All the best to you and the team." I cannot thank you enough for the absolutely AMAZING setup you did for our wedding. Having worked on other events together, I knew you would do an awesome job, but Olivia's attention to detail and the way she put my mind at ease through the entire planning was appreciated. Natalie, thank you for knowing just what needed to be done...even when I thought I knew what I wanted.... you knew better! We could not have been happier than we were that day, and we owe so much of that to you. Thank you for a blushing beautiful day!" Thank you so much for everything. Our wedding was just like we wished it to be. It was perfect! Moving the reception to the pavilion was a great call! And the decor was beautiful! Just as we had wished! Thank you for your great efforts in making our wedding so memorable and so problem-free!" Words will never be able to express to you how thankful I am to you for everything you did on our wedding day. I just wanted to personally tell you that I was speechless with how professional you were and how effortless you made it seem and feel for me (I'm sure behind the scene was a different story). You made my day PERFECT. You made me and Johnny feel ease the from the second we met you. You were organized, helpful, and involved. You listened to everything I had wanted and created a day that was out of a dream for me.......The decorations were stunning, the back drop of the location was amazing, and your touch on everything was flawless. You paid attention to every single detail and captured more than I ever expected. So, THANK YOU THANK YOU THANK YOU!!!!!" I just wanted to thank you and the Wildflowers staff on doing an amazing job on the flowers and the decor. Everything looked beautiful and I received countless compliments on it for all events. I felt like I was in a fairy tale during reception. I appreciate all your help and making my vision/color scheme become reality. You were wonderful to work with. I was a little nervous the week of but luckily it all turned out great. I hope this email finds you well." In all the flurry on Saturday, we did not have the opportunity to thank you for everything you and your team did for us. The personal flowers were exactly what we wanted and so very pretty. They matched both the decor and our attire and so pulled the whole color scheme together. I particularly loved the various subtle color variations of the roses in the bouquets, the flowers on the dinner tables, and the arbor: they were just simply beautiful. The decor at all three event venues was absolutely perfect. We loved the floral arbor and the chair decorations at the ceremony. The table decorations - table cloths, napkins, centerpieces - and the draping and twinkle lights at Seagrapes Overlook were totally beautiful. The after-party couches were great and the uplighting and other decor there was so fun and intimate. We had a wonderful time and want to thank you so much." " To Amanda and the team, what a STUNNING STUNNING STUNNING job you guys did on the whole event. From the ceremony, cocktail hour and RECEPTION TENT -- you left my guests absolutely speechless!!! I had guests coming to me and asking if they could use you guys for weddings they are having in the states that's how magnificent of a job was done. You left everyone astounded. I remember walking into the tent for some air after the ceremony because I was dying of the heat and just being completely blown away that I forgot why I even walked in! It is a feeling I will never forget for as long as I live. THANK YOU AGAIN FOR EVERYTHING! For working with me on every request, putting up with me changing my mind last minute and overall just completely outdoing yourselves! I cannot wait to see your pictures!" We want to thank you for all your hard work on making our special day beautiful. We must admit your company blew our expectations...we were thoroughly impressed with EVERY bit of our ceremony and reception decor. Your flowers were breathtaking. Thank you again for everything...you truly made our special day magical!" I just wanted to thank you SO MUCH for the absolutely stunning work that you did for our wedding rehearsal, ceremony, and reception! We were in awe (and tears)! Every single one of our guests commented on how beautiful our flowers and decor was and we still receive comments many months later, it was truly spectacular and your team did a fabulous job! We honestly cannot say enough nice things about what you did, you truly gave us the wedding of our dreams! Thank you again!" "Thank you everyone for an absolutely gorgeous event! 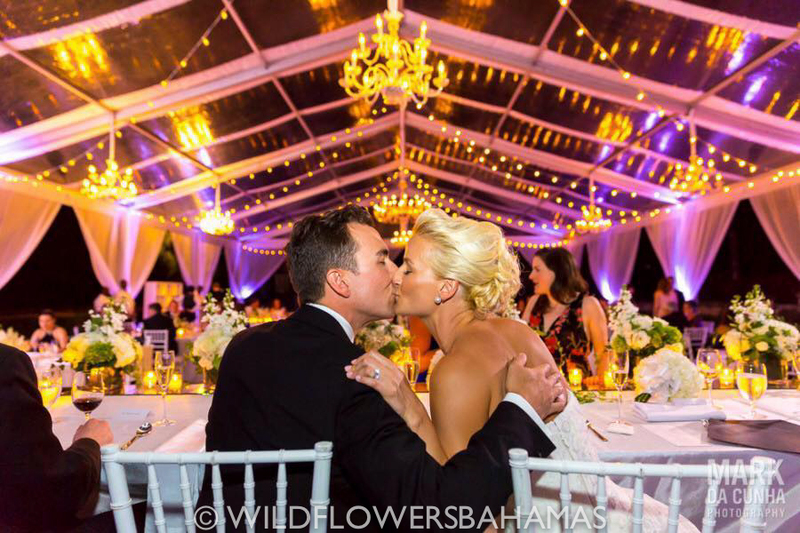 We are already trying to think of a reason to throw another event in The Bahamas with you! You made it a weekend that will be impossible for not only us, but also our guests to never forget. Thank you!" "Wildflowers hit it out of the park on this one! You build a giant air-conditioned tent in day! And even had time to decorate it to the 9s!" What can I say? The service you provided for the Elizabeth wedding was excellent! You were both delightful to work with, so very professional but with a warm and personal touch. The tent was stunning, stunning, stunning! Araxie, you were so hard working, always kind and agreeable. Your part in making the day and weekend such a huge success is much appreciated and will be long remembered." I just wanted to say how much I appreciated you and the Wildflowers team organising and executing such a fabulous wedding for John and I last weekend. I could not have asked for a better coordinator - the ceremony was amazing and the reception decor was truly straight out of Pinterest (every modern girl's dream now days - haha)! Even the rain didn't get in the way. You staying calm and not making a big deal out of it really kept me calm - I can't thank you enough for that! I think you had already left, but it rained for a second time while we were eating dinner but instead of getting upset, the entire wedding party just went with it and eventually all ended up in our bathing suits dancing!" Thank you all SO MUCH for such amazing decor all weekend long for Mica and Renato!! It was truly stunning and Mica was THRILLED!!! I can’t thank you enough for accommodating so many of our last minute requests - i.e. Beach Deck tent for Thursday night, ceremony site rain plan altar, etc. It was such a special weekend due much in part to all of you. I so enjoyed working with each of you and very much appreciate your friendly and professional attitudes about everything." How truly wonderful you have been! I can sincerely say that I would not have been able to do this without you! It has been such a pleasure working with you. You have been impeccable! Thank you so very much! Everything that you provided was perfect! Thanks again for everything!! We had a wonderful wonderful evening that we will remember forever!" Thank you for making our ceremony and reception site beautiful! It was more beautiful than we could have imagined! From my bouquet to the captain's table, everything was exactly what we wanted! It was a pleasure working with you! Thanks for making our wedding day so memorable!" Thank you all so much again for your help with the wedding. Your partnership has truly proved to be invaluable. Your tremendous attention to detail, dedication to your craft, and willingness to lend a hand wherever needed is greatly appreciated. It's sometimes difficult producing an event in another city, let alone another country. However, having your team as our local eyes and ears made the entire process run so smoothly and put our minds at ease. You played a huge part in making this vision a reality. We can't thank you enough for making this all possible. We look forward to continuing our partnership, and to collaborating on many, many more successful events!" I can not thank you enough on how beautiful everything turned out! I was so shocked on how amazing Friday night looked and the colors were perfect! Saturday was absolutely breathtaking! You and your team did a FABULOUS job! It was exactly how I envisioned it and if not better!" "Thank you so much for everything! I wanted to email you myself and express how amazing you did with everything. Coming right from Courtney’s mouth she said that it turned out exactly how she envisioned it and it was her dream wedding came true. Courtney’s happiness is my number one goal and she couldn’t have been happier. That also includes Friday night because that turned out great just with a minimal amount of décor." Thank you! So happy it's all finished! You guys did a fantastic job. My husband and I were very happy with the ceremony and reception. It was beautiful! Please tell Mrs. Appleyard we truly appreciated everything. Thanks again!" Just wanted to send you a belated thank you for the work you did on our wedding May 1. The decor was perfect and everyone commented on how stunning the floral centrepieces were. I loved my bouquet and wish I could have brought it home! A big thank you to you and your team for pulling everything together." A HUGE THANK YOU to you and your team for putting together a memorable evening for us! From the flowers and setting to the ambiance and music, it was absolutely perfect and breathtaking. Many thanks again!" I want to first thank you for making our wedding a dream come true. Every detail was as planned and flawless!! Thank you for making it seem so easy and being flexible to accommodate me in every way possible. The flowers, ceremony, entertainment, food, wine, rehearsal dinner, pictures, cake, cigars, hair & make-up, bridal dress and bridesmaid dresses were out of this WORLD!!! Best time of my life!! Thank you for making it possible and so special!!! You were amazing!! The most beautiful setting I have ever seen!! You were amazing!! The most beautiful setting I have ever seen!!" "Thank you so much Araxie! It was a pleasure working with you and the Wildflowers team - all of the set up (from Mandaap, to cocktail hour, reception etc) looked amazing. Everyone loved it - especially Hem and I." It is hard to believe that the wedding celebration is over. It is so long in planning and so quick to end. But.... You did an amazing job. We were all very happy with the outcome. The space looked incredible and I think that we achieved the best possible result. Thank you." Just a note to thank you for the wonderful job that wildflowers did with Mia and Anthony's wedding. The flowers and table settings were gorgeous! Everything that your company did for us was professional and just amazing. I was asked many times who did the flowers and decorated the room and was pleased to tell them that you guys did a superb job for us. Thank you again and I look forward to working with you again in the near future!!" Thank you so much for being a part or our special day. You have helped make my dreams come true with your vision and special touches to make everything look beautiful! Many blessings to you." I cannot thank you and your team for making Stella’s wedding celebration more than anything I could have ever dreamed possible! I know you told me at the beginning not to worry, you would treat Stella as if she were your own daughter. I had no idea how much hard work, how much detail and how much coordination was involved in a wedding like this…. You know how special Stella is to me and you gave my family a celebration that we will never forget, I felt like I gave away a Princess that night!!! It still feels like an incredible dream. Words cannot express my gratitude to you." "We would like to say thank you!! Everything was perfect....and we loved the centerpieces!!! You did such an amazing job and helped our day be perfect!!!! We really appreciate all you did for us!!!!" "Olivia, I don't know where to start... It took me a day or two to gather my thoughts. The thought, the energy, the time, the creativity that you all put towards my wedding was absolutely amazing. Everything looked incredible! I so impressed and extremely elated! I attempted to hide my emotion as I walked down the aisle looking how beautiful everything materialized. I can't thank you enough. You truly made my wedding well beyond my dreams! Thank you, thank you, from the bottom of my heart. I can't wait for someone inquire about a first class florist in the Bahamas. The won't need to ask twice about whom I would refer...."
Kurt and I just wanted to give you guys a BIG thank you for such an amazing job you guys did on our wedding--it was truly a dream. The flowers were perfect, the decor worked together perfectly and linens matched the theme so well! Our guests couldn't stop staring at the table setup and the lounge area for the dance floor! We had so many comments from our guests remarking that they had truly never been to a wedding as beautiful as ours! Alexander, thank you for the lighting recommendations--the up lighting around the cloisters truly completed the setup. The candles worked wonderfully and the up trees provided the right ambience. The books worked beautifully as well! I hope that you guys will put them to good use--it certainly made for an easier (and lighter) flight coming back to Canada :) Again, thank you Natalie, Alexander and the rest of Wildflowers team. You made our wedding come to life!" I just wanted to thank you for the beautiful decor for my husband's 70th birthday last evening. I thought the room looked spectacular and I loved the table decorations. They were perfect! The lounge furniture was placed perfectly and a blast was had by all of us. Thank you for making it so easy to work with you. Again, thank you for all of your hard work to make the room look so special. I look forward to the chance to work with you in the future." "We just wanted to write to you to thank you for all of your excellent work and effort for our wedding earlier this month at the Ocean Club! Everything was just beautiful, and all of the special touches you put together really made our events not only elegant but also completely in line with the look and feel we were aiming for. It's been a pleasure working with you throughout our planning process and we cannot thank you enough." "It was a pleasure meeting you at Lyford and I cannot thank you enough for your services. You really understood what I had envisioned and I appreciate your patience in answering all of my e mails. We had many people in attendance at the Rehearsal Dinner that are members of Lyford Cay and they all exclaimed that they had never seen the Yacht Club look so romantic and beautiful. I was so thrilled with the blue uplighting inside the Club. It added such an ambience to the party. It was a pleasure doing business with you and maybe sometime in the future, we will have another event in the neighborhood and can use you again. Good luck with your sister's big day. I understand that it is coming up soon." "I just wanted to write and thank each and every one of you for making my dream wedding come true. Everything was more beautiful then I could ever imagine and you really made every piece of the puzzle fit together so well. I know there was last minute changes and I wrote a lot of emails but I really want to extend my gratitude for everything you did for me. Every single one of my guests were blown away and I have never heard so many compliments in one night."